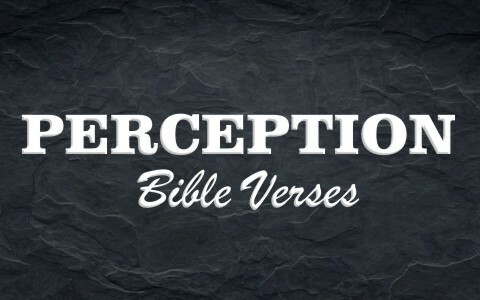 Here are eight of the top Bible verses about perception. Imagine you’re waving your arms and trying to stop traffic just before a corner because you know the bridge is out. To the drivers, everything looks fine. They see no reason to stop because they see no highway barricades, so their perception tells them nothing’s wrong. To them, it’s right in their own eyes to drive around the corner, and they do to their own hurt. Despite your warning, they didn’t stop, and suffered the consequences. Their perception didn’t help them. And, they missed the wise man’s advice because they were too busy listening to what they thought was right. One great way to change our perception, which might not be reality anyway, is to be in the Word of God on a daily basis. James tells us something that is just the opposite of the way the world thinks. Most believe that trials are not good at all but we are to count it or see it as beneficial when we encounter trials because the testing of our faith produces steadfastness in our trials. Without having the joy, the trials will only bring sorrow, but if we look at it from God’s perspective, we can count it as a joyful experience, knowing that God is producing a steadfast faith through various tests that we go through. To change a person’s perception, we need to change what a person thinks of, and if we’re setting our minds on things that are below, here on earth, we’ll not see the things that God is doing through us and in us by what we are going through here on earth. In other words, let our heavenly thinking overshadow those things on earth; let the eternal things of God dominate our thinking over the present, evil world we live in today. This same verse is found in Proverbs 16:25 where again, Solomon writes, “There is a way that seems right to a man, but its end is the way to death.” Why would Solomon repeat this? Did he forget that he already wrote Proverbs 14:12? No, I think something that’s repeated in the Bible, and especially in Jewish literature, is always done so to put great emphasis on it, and Solomon was stressing the fact that humans seem to know what’s right, but later it blows up in our faces. Without seeking God’s wisdom, which means we must first fear God, we’ll never even be able to ask for it (James 1:5). I included this verse because of our natural tendency to judge others or ourselves when we see them or us going through trials. We might think, “Okay God, I deserved this,” but the truth might be that the Lord is only testing “the righteous.” God doesn’t test our faith so that He’ll learn how weak or strong our faith is, rather it’s for us to see how strong or weak our faith is. He already knows how strong or weak it is, but a faith that’s never been tested cannot really be trusted. Perception for a lot of us may not be reality because we tend to focus on the here and now, but we often start looking at tomorrow before it even gets here, and begin to worry ahead of time about those things that may not even come to pass. If we only believed what God’s Word promises that He will supply every need of ours and it comes out of the abundance or riches of Jesus Christ, then we would not be anxious over things that we have no control over. In almost the same context as Philippians 4:19, Jesus tells us to look at the creatures in nature and see how God even takes care of the birds of the air, despite the fact that they neither reap nor sow and gather into barns, but God still ensures their physical needs are taken care of. Jesus puts it this way; “Aren’t we more valuable than the sparrows of the air?” Of course we are, so if God makes certain to provide for His creatures, why would He not provide for us? One great way to change our perception, which might not be reality anyway, is to be in the Word of God on a daily basis. That can change our human perception to a godly perspective. The Word of God has real, effectual power (Rom 1:16; 1st Cor 1:18) while our perceptions do not. Maybe that’s why “these Jews were more noble than those in Thessalonica; they received the word with all eagerness, examining the Scriptures daily to see if these things were so” (Acts 17:11). Their perception was changed forever and so were their souls because they began to see the mind of God as revealed in Scripture and the more you’re exposed to the Word of God, the more the Word of God changes your perception…and always for the better. Thank you Justin. It has been corrected. Next post: What Is A Spiritual Awakening?